Food Costs > How Much Does Gruyere Cheese Cost? How Much Does Gruyere Cheese Cost? Gruyere Cheese is a hard yellow Alpine cheese that was named after its place of origin in Switzerland and is commonly labeled as the true Swiss Cheese. Being used since 1115 in the surrounding Swiss villages, Gruyere will dry for two to three months before it’s transported to a sandstone cave, where it will rest at a constant temperature of 55.4 degrees for several more months to complete its maturation process. Gruyere is usually produced in wheels but can often be sold in slices or wedges as well. On average, a pound of Gruyere cheese is going to range anywhere from $10 to $19. The costs will depend on where you purchase it, the age, how it’s prepped and the quantity. Because it’s too expensive to purchase an entire wheel, most retailers sell Gruyere cheese in smaller slices or wedges, which are sold by the pound just like the whole wheel. On Amazon.com, the most popular aged Gruyere, which is often sold by the pound, retails for about $18 to $24 here. At Sam’s Club, the costs are closer to $11 per pound, with most packages containing 0.5 to 1.5 pounds. Trader Joe’s, according to their official website, sells it for $11.99 per pound. At Publix, their prices, depending on the current sale price, can range from $12 to $17 per pound. Gruyere cheese that is new will taste sweet but slightly salty. As it begins to age, however, it can taste creamier and will have more of a nutty flavor. With age, however, the cheese will be earthy and will also develop cracks and a grainy texture. Basically, the older the Gruyere cheese is, the better it is. Age makes the quality of this type of cheese, and if it is aged perfectly, its price can go up, just like many other varieties. Authentic Gruyere cheeses are mostly sourced from Switzerland where the cheese originated. Once these cheeses are imported, the price will definitely increase. Gruyere cheese that is manufactured in the United States will be much cheaper than authentic Swiss cheese. Gruyere cheese that comes in wheels can either be sold as a whole wheel or as a piece of the wheel, known as a wedge. Most Gruyere cheese wheels weigh somewhere around 16 pounds, but there are others that reach up to 80 pounds, which are often used in gourmet kitchens. Its taste is known to be slightly salty, with a flavor that will vary as it ages. To most, it will be creamy and nutty. If you want top quality Gruyere cheese, pay close attention to the age. If you don’t know about the age, ask the retailer about its age or pay close attention to the label. 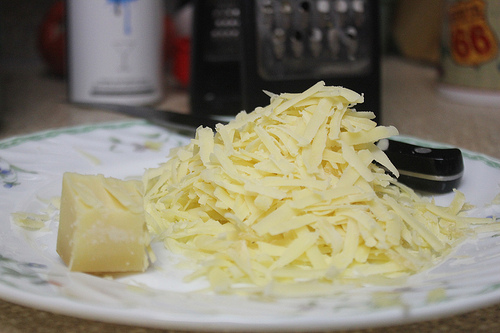 If you only need the Gruyere cheese in small amounts, simply buy slices or wedges, just enough for your consumption. However, if you are a large Gruyere cheese consumer, you can get large cheese wheels and stock them at home. Gruyere cheese, like most aged cheese, can last for quite some time. If you need a large amount of Gruyere cheese, it would be best to buy a whole wheel to save effectively save in the future. This cheese, when compared to other varieties, can be pricey. If your recipe is calling for this type of cheese and you don’t want to spend the extra money, consider substituting for a generic swiss or mozzarella. TheSpruce.com also recommends Emmental, Jarlsberg, Beaufort, comté or raclette. All of these substitutions may or may not work, and it will depend greatly on the recipe you’re using.